Bus lines: 6, 7, 15, 33, 34, 59, 63, 67, N12 Metro stops: Maria Cristina (line 3), Hospital Clinic (line 5) Tramway stop: Francesc Macià (T1, T2, T3) From Barcelona-El Prat Airport: The most convenient option is our own Van DREAM shuttle service. 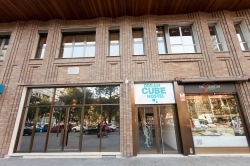 We pick you up at the airport and bring you directly to Dream Cube Hostel. You avoid lugging your baggage around. By bus 1. Outside the terminals, you can take Aerobus A1 from Terminal 1 or Aerobus A2 from Terminal 2, to Plaza Espanya square (approx. 25 minutes). 2. Take metro line L3 (green line) direction Zona Universitaria. 3. Exit at ‘Maria Cristina’ (7 minutes). 4. Go out to the street and take any tramway with bound for Francesc Macià (T1, T2 or T3). 5. Exit at the last stop: Francesc Macià (5 minutes). 6. Walk down Loreto street and take the first street to the right, Avenida Sarria, and cross the park. The Hostel is on that street, No. 67, Avenida Sarria. By train 1. From Terminal 2 – B take the train to Barcelona Sants Estació (20 min). 2. Change from the train to Metro L3 (green line) with direction Zona Universitaria. 3. Exit at ‘Maria Cristina’ (5 minutes). 4. Go out to the street and take any tramway with bound for Francesc Macià (T1, T2 or T3). 5. Exit at the last stop: Francesc Macià (5 minutes). 6. Walk down Loreto street and take the first street to the right, Avenida Sarria, and cross the park. The Hostel is on that street, No. 67, Avenida Sarria. From the bus stations: Estació del Nord bus terminal 1. Opposite the bus terminal take metro L1 (red line) at Arc de Triomf with direction to Hospital de Bellvitge. 2. Exit at ‘Espanya ‘ (10 minutes). 3. Change to metro L3 (green line) with direction to Zona Universitaria. 4. Exit at ‘Maria Cristina’ (5 minutes). 5. Go out to the street and take any tramway with bound for Francesc Macià (T1, T2 or T3). 6. Exit at the last stop: Francesc Macià (5 minutes). 7. Walk down Loreto street and take the first street to the right, Avenida Sarria, and cross the park. The Hostel is on that street, No. 67, Avenida Sarria. Estació de Sants bus terminal 1. Go into Sants train station (opposite the bus terminal) and take Metro L3 (green line) with direction to Zona Universitaria. 2. Exit at ‘Maria Cristina’ (5 minutes). 3. Go out to the street and take any tramway with bound for Francesc Macià (T1, T2 or T3). 4. Exit at the last stop: Francesc Macià (5 minutes). 5. Walk down Loreto street and take the first street to the right, Avenida Sarria, and cross the park. The Hostel is on that street, No. 67, Avenida Sarria. From the train station: Estació de França 1. 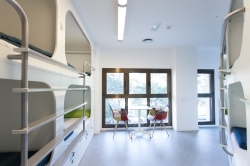 Take metro L4 (yellow line) at Barceloneta (5 minutes walking distance) with direction Trinitat Nova. 2. Exit at ‘Verdaguer ‘ (8 minutes journey) 3. Chante to metro L5 (blue line) with direction Cornellà Centre. 4. Exit at ‘Hospital Clínic’ (4 minutes). 5. Follow the exit signs to Urgell street. Walk two blocks up the hill to the petrol station. 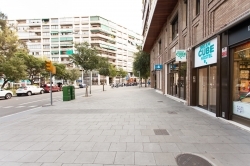 Take Avenida Sarria street, and walk to nº67. Estació de Sants 1. Take Metro L3 (green line) with direction Zona Universitaria. 2. Exit at ‘Maria Cristina’ (5 minutes). 3. Go out to the street and take any tramway with bound for Francesc Macià (T1, T2 or T3). 4. Exit at the last stop: Francesc Macià (5 minutes). 5. Walk down Loreto street and take the first street to the right, Avenida Sarria, and cross the park. The Hostel is on that street, No. 67, Avenida Sarria. From the port/ Ferry: 1. Near the ferry terminals, opposite the Columbus Monument, you will find Drassanes metro station. Take metro L3 (green line) with direction Zona Universitaria. 2. Exit at ‘Maria Cristina’ (14 minutes). 3. Go out to the street and take any tramway with bound for Francesc Macià (T1, T2 or T3). 4. Exit at the last stop: Francesc Macià (5 minutes). 5. Walk down Loreto street and take the first street to the right, Avenida Sarria, and cross the park. The Hostel is on that street, No. 67, Avenida Sarria. From the metro: Plaça Espanya 1. Take metro line L3 (green line) direction Zona Universitaria. 2. Exit at ‘Maria Cristina’ (7 minutes). 3. Go out to the street and take any tramway with bound for Francesc Macià (T1, T2 or T3). 4. Exit at the last stop: Francesc Macià (5 minutes). 5. Walk down Loreto street and take the first street to the right, Avenida Sarria, and cross the park. The Hostel is on that street, No. 67, Avenida Sarria. Plaça Catalunya 1. Take metro L3 (green line) with direction Zona Universitaria. 2. Exit at ‘Maria Cristina’ (16 minutes).